Wayfarer Foothills is divided into two regions: green lowlands and a snow covered hilly area to the north. During my heroic ancestor’s time, this was an unmarked area between the city of Rin to the east, and Borlis Pass to the north west. 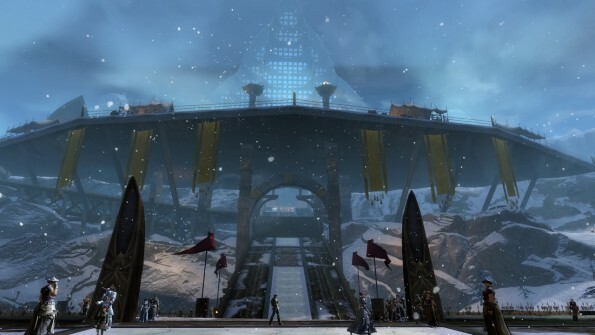 The pressure from Jormag has given the norn a reason to make the foothills as hospitable as possible. 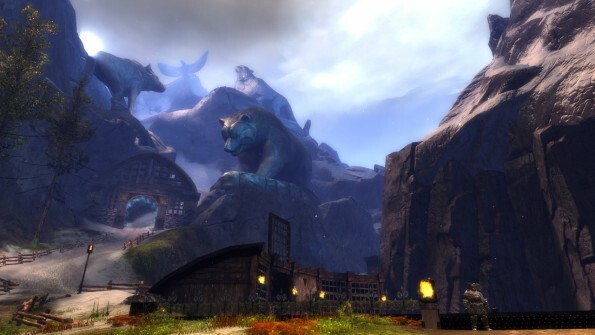 Forts, homesteads, shrines to the Spirits of the Wild, and breweries have all been built since the norn’s resettlement. The usual troubles have followed them, (such as the Sons of Svanir) but now they also face the dredge which inhabit deep caves throughout the foothills. Hoelbrak was founded by Asgeir Dragonrender after Jormag the dragon’s rise in 1165 AE. Before that time, norn lived further north in the Far Shiverpeaks. The norn would have stayed and died fighting to Jormag’s minions had the Spirits of the Wild not guided them. With the sacrifice of Owl, and the diversion granted by Wolverine and Ox, norn followed Bear, Wolf, Raven and Snow Leopard south to the mountains where dwarves used to live. Norn in Hoelbrak live in the five large lodges of Bear, Wolf, Raven, Snow Leopard and the Great Lodge. These deeply spiritual people still revere their Spirits of the Wild and devote much of the city to them.